In the past five days 23 powerful Brazilians have been arrested with even more warrants still outstanding. The country’s stock market has become a whipsaw, and the real, its currency, hit a nine year low. All of this is due to far reaching corruption scandal at one massive company, Petrobras. 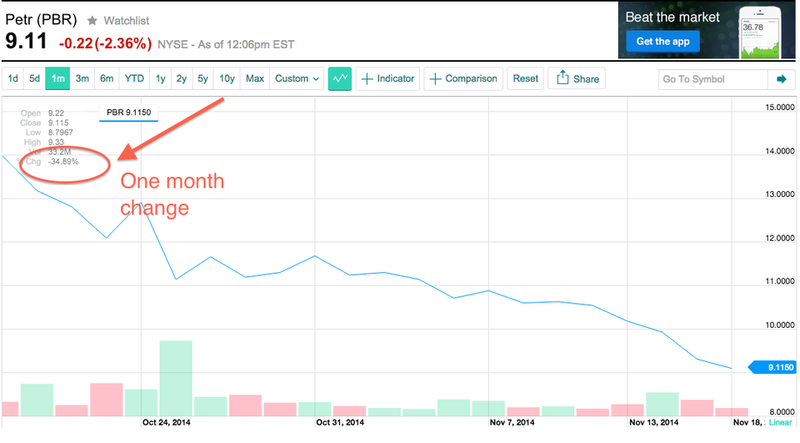 In the last month the company’s stock has fallen 35%. Petrobras is a $US58.9 billion oil and gas company of which the Brazilian government controls 54%. Five years ago, when the company was growing at a strong and steady clip, it became almost iconic — a fixture in images of Brazil’s new self. Think: Smiling pictures of former (and well-loved) President Luis Inacio Lula da Silva in a hard hat and work clothes. But in the last few years Brazil’s economy has slowed, it’s star has diminished, and Petrobras itself is, in part, to blame. Now, amid this corruption scandal, it has become a different kind of symbol for the country — a symbol of government corruption and whether or not the country has developed a system with the capability to clean it up. She would know, she’s being investigated herself. 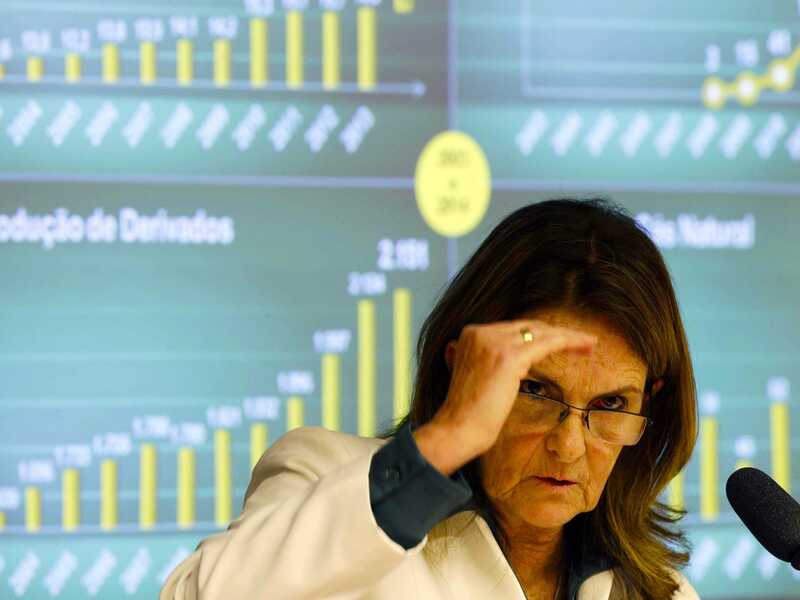 There are two very serious issues with Petrobras — corruption and mismanagement. Corruption first. Authorities are calling their investigation into the company ‘Operation Car Wash,’ and it has reached the highest levels of the Brazilian government. President Rousseff’s regime is accused of shaving 3% off the company’s contracts in kickbacks to finance her election campaign. In October there were were reports that she admitted that there was a “deviation of public money,” though she later denied making those comments. In March a Petrobras former refining head, Paulo Proberto Costa, was arrested for taking $US400 million from the company to make political donations. There’s also an investigation into Petrobras’ $US1.25 billion purchase of an oil refinery in Texas in 2006. The whole thing was a disaster and led to a $US500 million write down. Authorities in Brazil, The Netherlands, The U.S. are also looking into $US100 million in alleged kickbacks Petrobras gave to SBM Offshore NV, a Dutch company that makes ships that carry oil. And of course, there are the most recent arrests and warrants issued. Many are for high level executives at construction companies that allegedly took kickbacks from corrupt Petrobras officials. Authorities raided 11 major offices, according to Bloomberg. That’s a lot of people to take down. Especially for a country known for letting the rich do what they want — for a country that has never sent anyone to jail for a capital markets crime in its entire history. 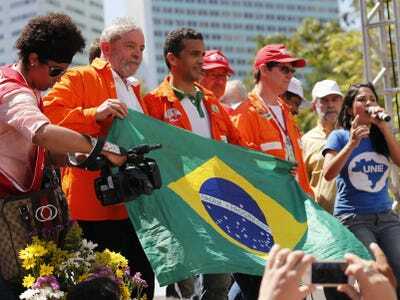 ReutersBrazil’s former president Luiz Inacio Lula da Silva (2nd L) holds the Brazilian flag with others during a demonstration supporting both the exploration of the oil in pre-salt layer on Brazil’s offshore, as well as Brazil’s Petrobras oil company, in Rio de Janeiro September 15, 2014. Last month in a no-media-allowed charity conference for Wall Street’s most brilliant minds, The Robinhood Investor’s Conference, short-seller Jim Chanos presented his short thesis for Petrobras. It tanked all of Brazil. Chanos was only talking about corruption in part. The other issue with Petrobras is with how the Brazilian government manages the company, or rather uses the company’s cash to its advantage. This is what it looks like now — Petrobras’ debt has increased 81% to over $US240 billion in the last two years. The government uses fuel controls as a kind of subsidy for the Brazilian people, as a result there’s less money for refining and the company misses production targets. 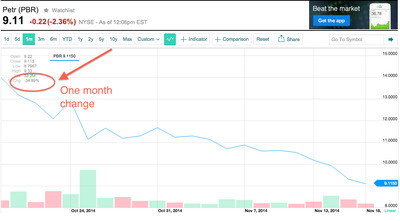 You can imagine what that does to Petrobras’ cash flow. There are two things lurking in the background of this story. One is a price and the other is man. The price, naturally, is the price of the oil which continues its slide. International prices are now getting closer to Brazil’s domestic prices, but that’s still not enough to make up for all of Petrobras’ debt and costs. And raising oil and gas prices for the Brazilian people is an ugly option. Rousseff won the Presidential election by only a hair, and protests over the summer were focused on the country’s high cost of living due to inflation and corruption in the incumbent’s regime. 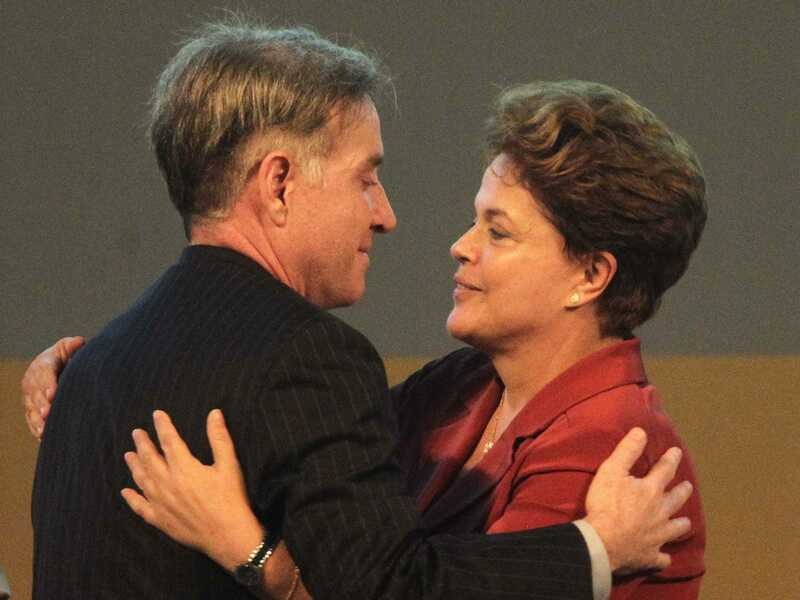 Right now, political will for difficult choices is hard to find in Brazil. But the will to punish those who have, historically, been above Brazilian law is not. On Tuesday one of the most closely watched trials in Brazil kicked off — the trial of former Brazilian billionaire Eike Batista. He is accused of stock manipulation and insider trading in an effort to save the massive empire of companies he built — an empire that took down Brazil’s market when it crumbled. What happens to Batista may also happen to Petrobras. If either is punished, it’s a sign of a new era in Brazil. If both are allowed to walk away from their corruption without a scratch, nothing has changed.